1. Cut jalapenos in half, length-wise. I would recommend wearing gloves with chopping and scrapping - if you touch your eyes you'll definitely be having a bad day. With a spoon, remove the seeds and white membrane. Smear softened cream cheese into each jalapeno half. 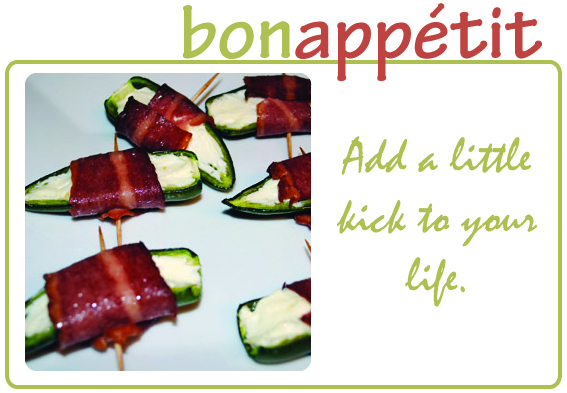 Wrap jalapeno with bacon pieces (1/3 slice). Secure by sticking toothpick through the middle. 2. Bake on a pan covered in foil at 375 degrees for 20-25 minutes. Serve immediately, or they're great at room temperature. I absolutely LOVE jalapeno poppers. Sooo good! One of favorites....Thank you for inspiring me. I'm going to have to make these for an Easter treat. lmao @ "you will definitely have a bad day" lol. these poppers are sooo simple! yet look fantabulous! love it! Seriously?! I love popper! I must make these!! I am not the best with spice either, but these look excellent! I love getting different appetizer ideas. Thanks! Oh my those poppers look delicious! 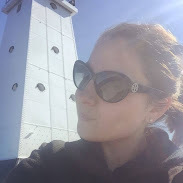 I just launched my new and improved blog, I hope you will stop by and take a look! Id totally do the poppers, minus the bacon of course,:) Yummy food as always girl! Yummy - I love these little poppers. I also love the look of that taco salad with doritos?! Fab! yummm i've been craving taco salad! Yes, use gloves! I learned the hard way and my hands burned for hours after my first time chopping jalapenos. Ahhh, I need a little pizza with pineapple in my life!! Yes yes yes!! I used to make a recipe just like this when I was eating low carb and was absolutely obsessed with it! You had me at jalapeno poppers! YUM! Anything bacon-wrapped is awesome in my book! These are a great idea and spicy food always fills me up faster. I’m going to have to try this. Thanks for the recipe. The taco salad looks really good too! Life is short buy cute shoes!